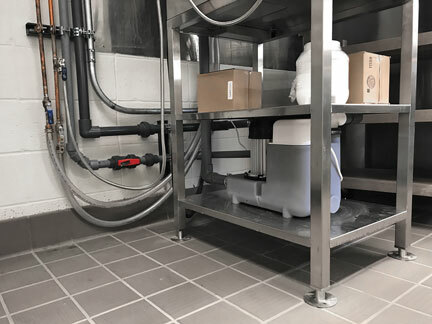 EDISON, NEW JERSEY (MARCH 29, 2017) – With its resistance to high water temperatures and its ability to directly connect to high-efficiency washing machines, the 1-horsepower Sanicom 1 simplex drain pump from Saniflo is designed to pump gray water away from demanding commercial applications, such as restaurants. 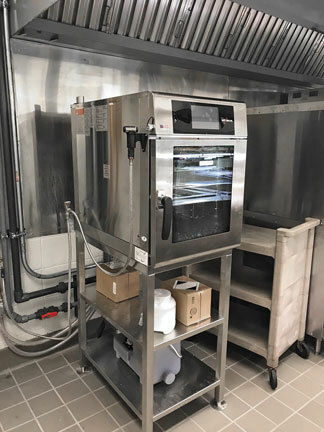 The Sanicom 1 handles up to 194°F water, making it perfect for commercial kitchen applications where dishwashers must operate at exceptionally high temperatures to meet health and sanitation standards. Other applications that can benefit from the Sanicom 1 are high efficiency washing machines used in commercial applications, which can connect directly into the pump, rather than indirectly through a laundry tray, eliminating the extra cost and installation of a utility sink. In addition, the unit is specially designed to withstand liquids with highly acidic properties, such as wastewater from processing applications. 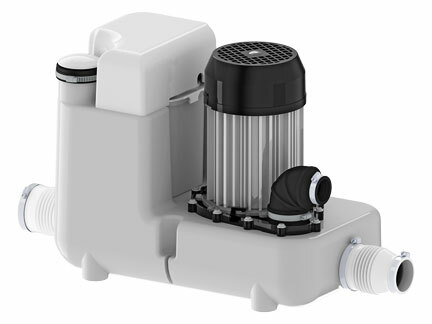 “Saniflo’s Sanicom 1 is a versatile drain pump that can effectively serve a variety of customer needs – from restaurant managers seeking to drain high-temperature dish water, to processing engineers needing to pump out wastewater resulting from food production,” says Regis Saragosti, CEO of Saniflo USA. The Sanicom 1 is capable of reliably and efficiently handling multiple gray water fixtures simultaneously, including commercial dishwashers, washing machines and other heavy-duty wastewater applications. Gray water enters through one of two side inlets, both measuring 2 inches, before being pumped to the drain line through a 1-inch rigid discharge pipe, which can remove up to 33 gallons per minute (gpm). The system includes a rubber discharge elbow that adapts to the discharge pipe and can be rotated 360 degrees, as well as a non-return valve. Sanicom 1 is able to discharge gray water up to 25 feet vertically, 250 feet horizontally, or a combination of both. (A vertical run of 3 feet is equal to a horizontal run of 30 feet.) It should be noted that when draining wastewater into the pump through either of the side inlets, an external check valve (not supplied) needs to be installed. The powerful, 1-horsepower motor and a non-clogging impeller design allow the unit to pass laundry lint and other small solids up to 3/8 inches in diameter. The unit vents through a 1-1/4-inch vent connection located on top. A two-way air vent should be used to allow free air flow both ways. 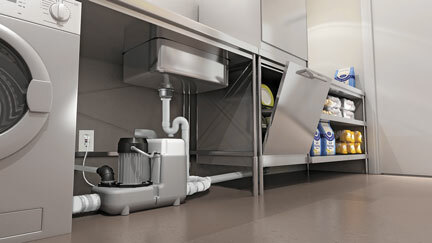 Unlike conventional plumbing installations, which may involve the hassle and expense of breaking through concrete to connect to a drain line, the Sanicom 1 above-floor plumbing system allows for a dishwasher or washing machine wherever needed. The two side inlets are located close to the floor, helping to speed installation by reducing the height at which floor-level plumbing fixtures must sit to achieve proper drainage. The Sanicom 1 will be available for shipment to Saniflo distributors in May 2017 and will have an MSRP of $785. Certification: CSA for the United States and Canada. IAPMO listed for U.S.
SFA SANIFLO U.S.A. – whose parent company originated macerating plumbing technology – offers a complete line of waste and drainage pumping systems for residential and commercial applications. Saniflo developed its innovative, “above-floor plumbing” technology more than a half-century ago and has led its commercialization worldwide. Today, the company markets macerating technology through 24 subsidiaries in 50 countries and has sold more than seven million units worldwide since 1958. Saniflo markets through independent sales agents throughout North America, and the product line is currently available at distributor and dealer locations throughout the United States and Canada. The Sanicom 1 can handle temperatures up to 194°F, making it perfect for demanding commercial applications, such as restaurant dishwashers. The Sanicom 1 can handle multiple gray water fixtures simultaneously, including commercial dishwashers, washing machines and other heavy-duty wastewater applications. The Sanicom1 is ideal for commercial dishwasher and commercial clothes washer applications. This picture shows an actual restaurant installation, involving a multi-use oven for steaming vegetables. The Sanicom1 is used to drain the hot water created as the steam condenses.